The HP Officejet 150 Mobile All-in-One is a printer that allows you to get professional results at home. This single machine is capable of printing, scanning and copying, making for a piece of equipment that can complete a number of functions efficiently. 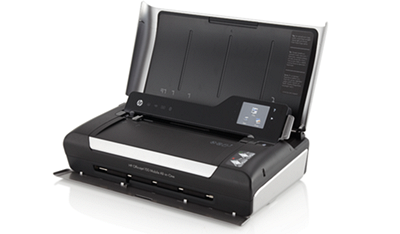 With a wireless capability via Bluetooth and a number of other connection abilities, the printer provides for a variety of options. The HP Officejet 150 Mobile All-in-One makes it possible to print, copy and scan within the confines of its 6.7” x 13.7” x 3.5” dimensions. Although the printer is compact, this does not take away from its abilities, which include working wirelessly, borderless printing, and being able to work on a range of different paper types. It comprises a touchscreen that clearly outlines the function being undertaken at any given moment and makes the printer easy to use. The HP Officejet 150 Mobile AIO weighs only 2.9kg, coupled with its size, it is not difficult to find a place for it to safely remain. The ability to print on all types of paper comes with that for double-sided printing. A CD with the printer drivers is included, so it is possible to get started using the printer soon after it arrives. Besides having Bluetooth connectivity, it is also compatible with an SD memory card. The resolution varies according to whether black or colour is being printed, at 600 x 600 dpi and 4800 x 1200 dpi respectively. The speed of the printer also varies at 5ppm in black and 3.5ppm in colour, and these may not be fast enough for those who are particularly impatient. Some users may not appreciate the lack of an output tray.